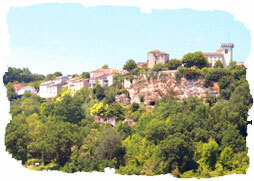 Roquecor is a sleepy medieval hilltop village, tucked away in the department of Tarn et Garonne, close to the border of Lot et Garonne. Once fortified, it still retains some of the original buildings, which date back to the twelfth century. Steeped in local folklore and set into the hillside directly below the village, lie several prehistoric caves, which were once inhabited by troglodytes. The village has won many awards for its floral displays and boasts a popular Sunday market, which trades all year long selling fresh local produce and crafts. There are numerous walks, many of which are signposted from the village and offer the best opportunity to appreciate the superb views and wildlife, including wild boar and the local deer, which can often be spotted at dawn or dusk.